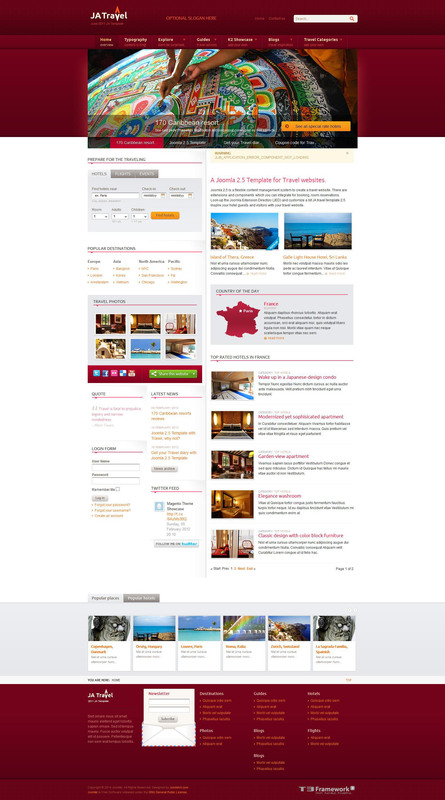 JS Travel - beautiful tourist theme template for CMS Joomla 2.5 from the developers JoomShaper. This template works on the company's platform Helix Framework, which provides fast loading pages, optimized code and a plurality of modular products. In the assembly includes a number of club extensions: SP Quick Booking Module, News Show SP2, Slideshow Pro SP2 and Simple Image Gallery Module and also includes support for K2 component and additional styles to it. The template provided a convenient extension of booking and room bookings through the site, which is excellent in handy when creating websites for hotels.